This article is about the geographical region in Vietnam. For the former country, see South Vietnam. Southern Vietnam (Vietnamese: Miền Nam) is one of the three geographical regions within Vietnam. 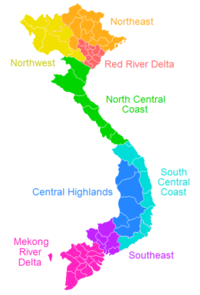 Southern Vietnam includes 2 administrative regions, which in turn comprises 19 First Tier units. 23,590.70 19,101,908 683.65 contains those parts of lowland southern Vietnam which are north of the Mekong delta. Two provinces border Cambodia. 40,576.00 21,015,795 434.00 is Vietnam's southernmost region, mostly containing small but populous provinces in the delta of the Mekong. It is sometimes referred to as the Southwest region (Tây Nam Bộ). Four provinces border Cambodia. Of all 19 First Tier units, 2 are municipalities and 17 are provinces.